Download GSEQ51Setup.zip from Georgia State University, USA. Unzip and run GSEQSetup.exe. Download GSEQ 51.exe from Universitat de Barcelona, Spain. Run GSEQSetup.exe. Running the setup file installs the program. Thereafter, to run GSEQ, click Start > Programs > GSEQ5 > GSEQ 5.1, or click on the GSEQ desktop icon. Bakeman, R., Quera, V., & Gnisci, A. (2009). Observer agreement for timed-event sequential data: A comparison of time-based and event-based algorithms. 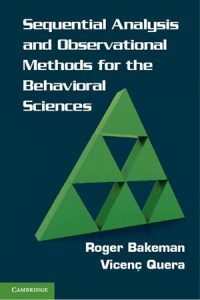 Behavior Research Methods, 41 (1), 137-147. Quera, V., Bakeman, R., & Gnisci, A. (2007). Observer agreement for event sequences: Methods and software for sequence alignment and reliability estimates. Behavior Research Methods, 39 (1), 39-49. Download ActSds.zip (Version 4.0, November 2016) from Georgia State University, USA. Download ActSds.zip (Version 4.0, November 2016) from Universitat de Barcelona, Spain. ActSds (Mangold’s INTERACT to SDIS converter) converts Mangold’s INTERACT data files, various versions, into SDIS files that can be subsequently analyzed by GSEQ. For information about INTERACT, visit Mangold-International.com. Download ObsTxtSds.zip (Version 4.1, February 20, 2019) from Georgia State University, USA. Download ObsTxtSds.zip (Version 4.0, November 2016) from Universitat de Barcelona, Spain. ObsTxtSds (Noldus’ The Observer to SDIS converter) converts Version 6 and later Noldus’ The Observer data files into SDIS files that can be subsequently analyzed by GSEQ. For information about The Observer, visit Noldus.com. The ZIP files contain the executable file, either ActSds.exe or ObsTxtSds, and a PDF file describing the program. Download ELign.zip from Georgia State University, USA. Download ELign.zip from Universitat de Barcelona, Spain. The ZIP file contains the executable file, Elign.exe, plus several sample SDIS data files. All programs were written in Embarcadero® Delphi® XE2 Version 16 Pascal and run on a PC under Microsoft Windows or a Mac running a PC simulation program.